Many people do not like aubergine and some do…So what if you love it and your partner does not? Have you ever thought of camouflaging it ? I do it all the time!!! Shhhh…its a secret…please do not tell anyone! You see my husband loves potatoes, but they are not exactly good to eat everyday so when we are vegetarian i do try to make some of his favorite vegetables. I like aubergine, so i thought of disguising it as onions in this dish and guess what??? He could not even tell!!! In fact he told me it tasted amazing ! This is a very easy recipe and goes well as a side dish with any fish , chicken or meat or even part of a vegetarian meal with daal (lentils) or just on its own with rice, naans roti etc. Heat the oil in a pan and add the onions and salt and let them sweat a bit. Meantime roast the coriander , cumin and fennel seeds till a bit fragrant taking care not to burn. Once a bit fragrant, cool it and powder it in the blender, i used my magic bullet for this. Once the onions are soft add the cubed potatoes and cook covered till the potatoes for a few minutes. Add the chopped aubergine and tomatoes and cook till the potatoes get done. Try not to add any water, if the potato cubes are large they wont cook quickly so try and make them into medium sized cubes (see the pic). Once the potatoes are cooked add the spices, add the green chillies and coriander leaves and cover it and cook for a few minutes. Serve well heated with rice, rotis or naans. If you want this dish to be richer you can deep fry the potatoes till soft and the aubergine too… then cook it less. Its very fattening that way…. If you dont like to peel the aubergine, then you can chop it with the peel. For Jain recipes just omit the onions and ginger. 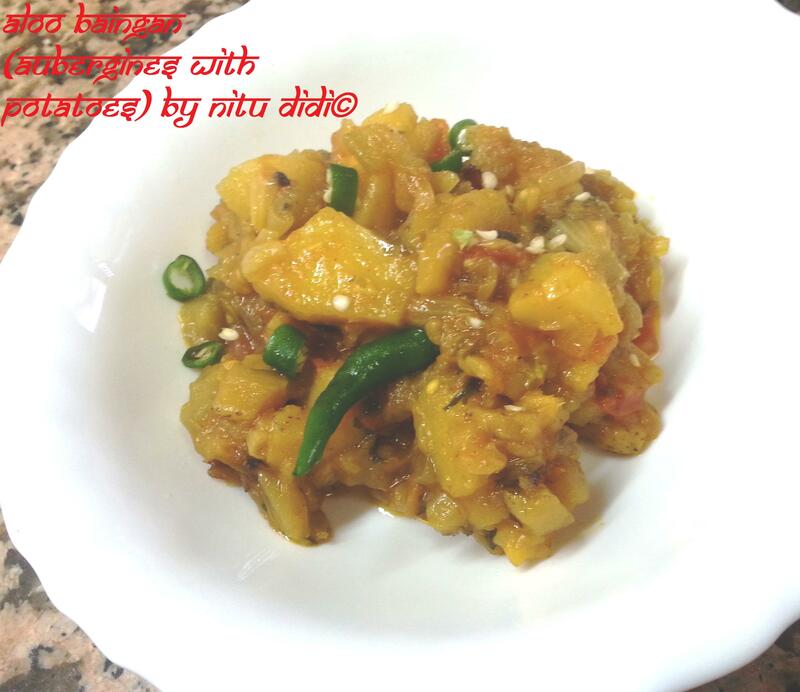 This entry was posted in Everything Vegetarian, Gluten Free, Healthy Options, Indian Restaurant Dishes, Jain recipes, Low Cost, Magic Bullet, Quick Recipes, Typical Sindhi Dishes, Veg Starters, Vegan and tagged aubergine, eggplant, healthy, Vegan, vegetarian. Bookmark the permalink.